Canada in October- Vancouver Gluttony — Always Packed for Adventure! One of the highlights of our stay at the Holiday inn Downtown Vancouver, was the wonderful barman, Tim. He was an expert on local restaurants and clearly loved giving out recommendations. i felt a kindred spirit. Out of his many suggestions, we picked two that were within walking distance of our hotel. 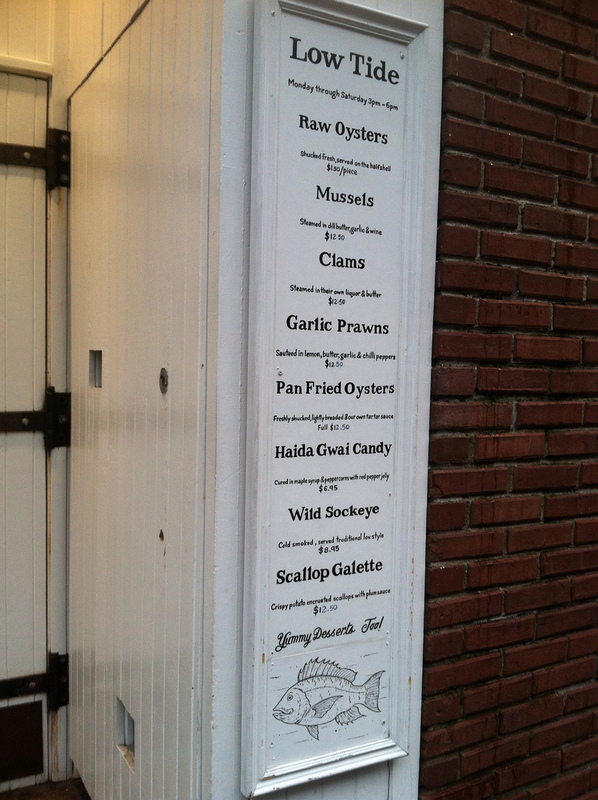 The first was a seafood restaurant, specializing in oysters called Rodney's Oyster House. i'm not sure if it was due to the popularity of the restaurants or that the culture in Vancouver is to eat early, but both of the restaurants were completely full by five-thirty. Rodney's has several tables on an upper deck, but most of the action takes place at the bar, where you can watch the oyster dishes being prepared. We had a table on the upper deck, over looking the bar, so we like we were part of the action. Rodney's is casual, getting a heavy after work happy hour crowd of business people. It's loud. The menu was filled with loads of great options and as often the case, our eyes were bigger than our stomachs. i'm not even a huge fan of oysters, but i wanted to embrace the experience and taste a bit of everything. We were stuffed before we got to our main courses and even then, we ordered dessert. The only justification was that we had walked. 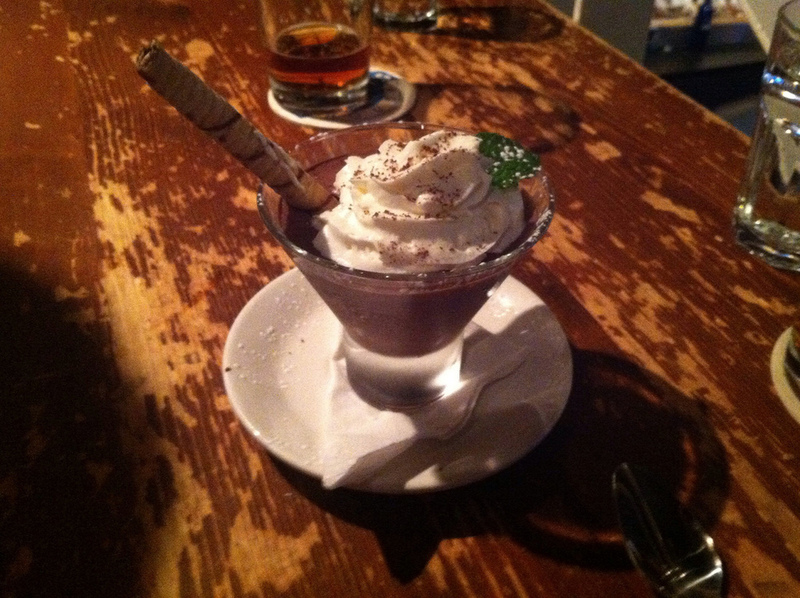 Mousse for dessert. A delicious end! 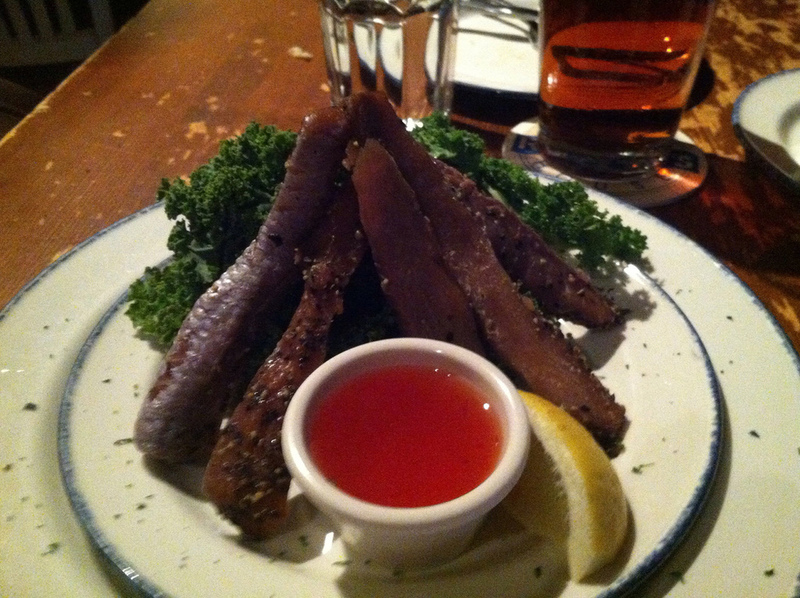 i have no idea what this is, it was something that we ordered as an appetizer and can best be described as fish jerky. it was like chewy -smoky-fishy- candy. We tried it, but couldn't eat it. Deep fried oysters with a cream sauce. The best oysters that I have ever eaten. I am still craving the amazing sauce. My main- halibut with a potato crust, served with asparagus. Tim recommended this dish to me and it was fantastic. Dan's main - scallops in a pasta dish. i highly recommend Rodney's. The food is amazing and reasonably priced. We had many meals that broke the bank on our trip and this was not one of them. I also liked the vibe of the place, nice (and abnormally good looking) waitstaff and fun decor. Check out their website for more details. 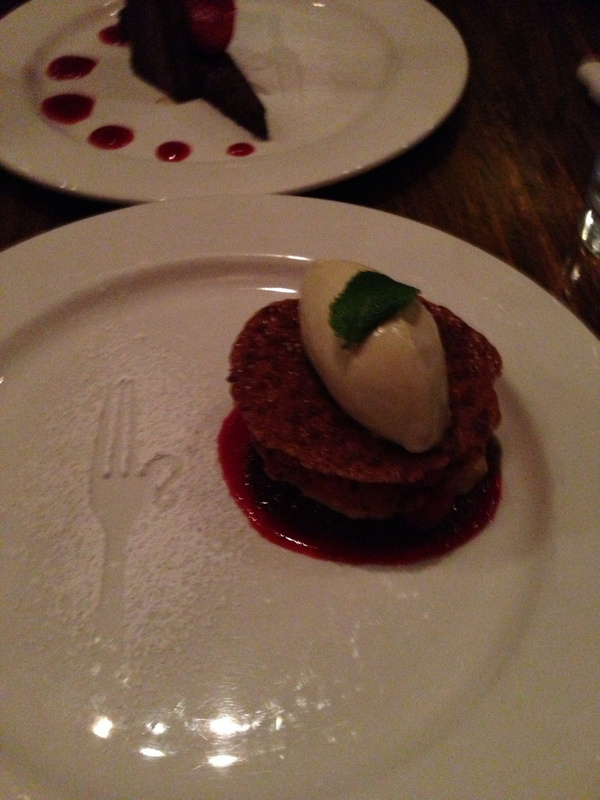 The second restaurant that we tried was a little place called the Twisted Fork Bistro. The Twisted Fork is a true hole in the wall, we would have walked right by it, if we had not been consulting our GPS. We arrived about ten minutes early and not realizing that we were early, walked in, as the restaurant looked open. We were curtly told to wait outside. We ran into another couple who was in the same predicament. We understood having to wait, but could have done without the attitude. It turns out, the snotty attitude came with the dinner. I think that it might be that the Twisted Fork is a current hot spot and they know it, but this was the only place in Canada that we experienced unfriendly service. Admittedly, the our server did warm up a bit, when we ordered an expensive bottle of wine, but to us, the damage had been done. What the Twisted Fork Bistro lacked in service, it more than made up for in fabulous food. i get why this is a popular restaurant, i was wowed by my meal. We each went with the three course special menu, where we had a handful of selections for each course. It was a great way to sample the food and far less expensive than ordering each separately. Unfortunately, most of our pictures didn't turn out at all. We both started with a salad that had goat cheese crumbles. I've recently discovered the joys of salads that utilize goat cheese. it adds a yummy creamy texture. Vancouver is a seafood town, so i went with a grilled trout for my main, grilled with a salty seasoning. Dan went with the roasted lamb for his main and i tried it. There are very few foods that I won't eat and lamb is on that list. i've tried it and have always had a gut wrenching reaction to it. My mom said that lamb was the only baby food that I would spit out. I always figured that since I am not a picky eater, that it was okay to dislike lamb. However, Dan's lamb dish looked good and in the spirit of adventure, I tried the smallest bite possible. Oh my goodness, heaven. It was tender and melted into my mouth. This is how I know that the Twisted Fork Bistro is a rock star restaurant, it got me to love a meat, that I have spent my entire life ardently opposing. It was better than my trout. We picked two desserts that we both would like and split them. One was a chocolate mousse torte and the other was a sorbet between two wafer thin cookies. Both were outstanding, like the entire meal. Dessert, the one picture that turned out. i highly recommend visiting The Twisted Fork bistro based on the quality and inventiveness of the food and the general atmosphere of the restaurant. The prices are moderate to high. We splurged on the wine and our meal was around two-hundred with tip and worth every penny. Arrive early, as it was completely full within minutes opening for dinner and expect attitude from the staff, which hopefully will not be the case and you will have a stellar dining experience.